This post is dedicated to my good friend Dr S, who has spent a fair bit of her spare time all over the world in search of the perfect french fries, or hot chips as they're known in Australia. I'm happy to tell you, Dr S, that I've found them! But the caveat - you'll need to take a 10 hour flight, then a 22 hour train ride, then spend 4 hours in a bombed-out minibus hurtling around narrow mountain roads, and then, a heart-stopping 2 hours' uphill walk. 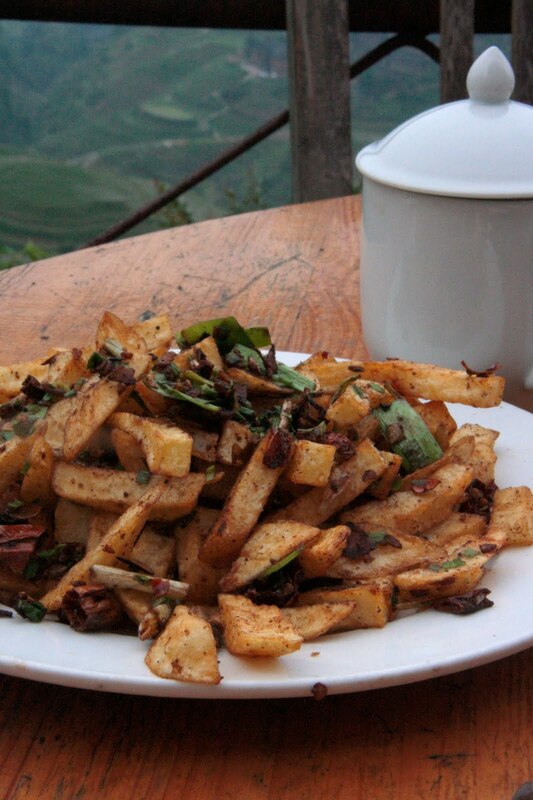 Then you may eat the world's best as you gaze out over the Longji Seven Dragons and Five Tigers rice terraces, as a cooling breeze flows gently past. Why are they the best? I've analyzed this carefully. They taste wonderfully familiar yet with flavours quite uniquely other-wordly, that I suspect cannot be reproduced anywhere else. 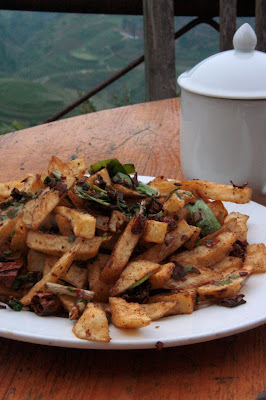 Firstly the potatoes - grown on the mountainside and fed with clear mountain spring water, they have more bite when cooked than regular potatoes. The oil used is pretty normal cooking oil, but has deep fried garlic, finely chopped, added to it. Secondly the genius extra of chopped smoked chillies, taken from above the kitchen fireplace. The guesthouse's famous dish is an entire chicken cooked inside a piece of bamboo, and as this smokes away in the coals below the chillies it must impart a very special flavour. Lastly, the whole lot is tossed in a wok with fried spring onions, salt, and more fried garlic. I tried them again the following day, and I'm afraid to report that this had been a once-off, never-to-be-repeated culinary experience. They came out looking like any old french fries. Obviously, in French Fry Heaven, the Dragons and Tigers constellation only aligns once every dynasty. Sorry, Dr S.